Today’s blog post is a review of an e-book written by Alex Trichilo. Alex is an Australian speech and language therapist and has a fantastic blog called The SpeeL which you should definitely check out. 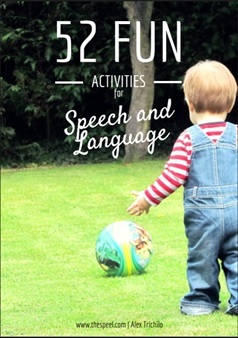 It’s full of great ideas and advice for parents, teachers and speech and language therapists and has some lovely handouts and developmental charts etc. free to download. Check out the site here. Alex published this e-book a couple of months ago, and we were fortunate enough to be sent a copy to review. It is aimed at parents of children aged up to 6, but I also totally recommend it if you are a speech and language therapist or a nursery or reception teacher, as it’s full of pages that you can print off and handout to parents of children on your caseload to give them ideas of how to support speech and language development at home. The book is 81 pages long and starts with some general advice as well as explanations about how the book works. Then the activities themselves are split into 10 sections – Out and About, Craft, Indoor, Cooking, Toys, Sports, Songs, No Resources, Board Games and Events. At the end are printable pages to go with some of the activities. I love the way the activities are laid out in this book – the pages look good, are full of information, but also don’t have too many words on, making them really accessible and easy to read. At the top of each page, it tells you which age level/s this would be suitable for (0-2, 2-4, 4-6) and which of the 4 focus areas it will target. The 4 areas targeted in the activities are Social Skills, Vocabulary, Literacy and Comprehension. In many cases, there are lots of other areas you could target too! Every page also has a box listing some vocabulary you could target during the activity. This includes nouns, verbs and adjectives/concept words. 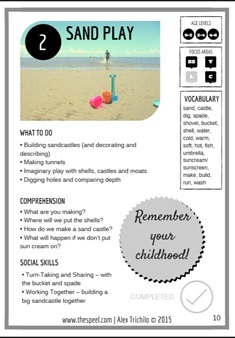 For example, in the “Sand Play” activity, nouns include sand, spade and shell, verbs include dig, build and wash and concepts include cold, warm, soft. You would need to tailor the vocabulary you use to your child and just pick out a couple of words at the right level for them, but the vocabulary box is great for giving ideas of words you can teach while playing with your child. Then each activity has a bullet-pointed list of “What to Do” and then additional sections depending on the areas targeted. Finally, there is a space to tick off when you have completed the activity and a top tip in a grey circle. That sounds like a lot of stuff to fit on a page, but it is presented simply and is not too much at all, as you can see from the samples here. Great handouts ready to print off and use. 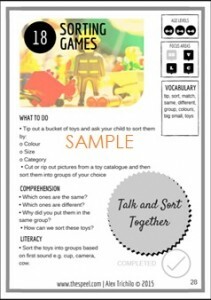 Full of simple, everyday games and ideas that are easy to do and require little preparation. 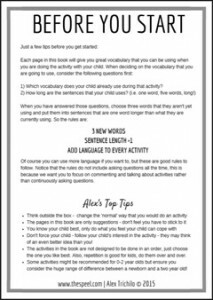 The vocabulary ideas and comprehension questions in particular are good for giving ideas of the possible ways you can extend an activity and use it to target language skills. Beautifully presented and simple, clear language throughout. All the extras that you need are included at the back of the book, including words for the nursery rhymes. The level of the vocabulary is a little varied. This is great as it gives you ideas whatever the age and level of your child, but do be aware that not all the vocabulary listed will be appropriate for your child – look through it and pick out the words you think will work for them – and add your own ideas too! (There are also some great tips on how many words to target and how to do it at the beginning of the book). On this note, if you are a therapist, when you give out pages from this book to parents, don’t forget to also include p5, which gives good tips about how to target vocab. Some of the ideas do include shop-bought toys or board games, but these are all inexpensive and basic, generic toys such as a farm set, cars or building bricks. If you don’t have the materials don’t feel you have to buy them – try another activity! Don’t be too rigid about the suggested ages. Some older children enjoy activities that are designed for younger children and some younger children can try activities designed for older children, especially if you adapt them. You know your child and what they will enjoy – take the ideas and use them in your own way to make fun activities you can do at home. If you are interested in the e-book, you can download a free 16-page sample on The SpeeL website here. Alternatively, you can buy the whole e-book for $9.99 (less than £5!) Click this link to find out more. It’s raining cats and dogs! – Ideas for teaching idioms.